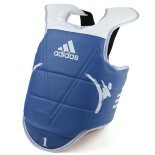 Lightweight and durable, this body protector is perfect for training and competition. 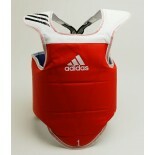 Features adjustable rear strap for a secure fit, and has padded shoulders for extra protection. 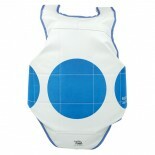 Has reversible sides with different colors (blue and red). Color: Red, Blue (Reversible Model) Size: XS(1), S(2), M(3), L(4), XL(5), XXL(6) Sold Individually .. 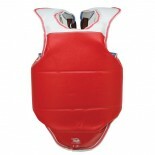 Body protector for training and competition. Reversible. 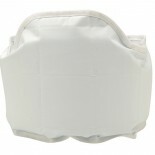 Padded shoulder protection. 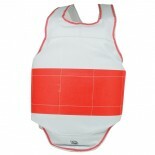 Designed for younger or physically smaller athletes. Easy and fast velcro closure on back. Size: XXS(0), XS(1), S(2), M(3) Color: Red/Blue (Reversible Model) .. Convenient, hassle-free clip fastener allows for easy wear and removal. Protects the midsection from serious injury. Size: CHS (0) CHL (1) S (2) M (3) L (4) XL (5) XXL (6) .. String tie for secure fit. Dot pattern. Protects the midsection from serious injury. Size: CHS (0) CHL (1) S (2) M (3) L (4) XL (5) XXL (6) ..
Red color filled scoring zone on one side and blue color filled scoring zone on the opposing side. Coverage extends to the kidney, collarbone, and shoulder regions. Secure string tie. 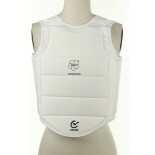 Size: CHXS (New Size) CHS (0) CHL (1) S (2) M (3) L (4) XL (5) XXL (6) ..
Protects the midsection from serious injury. 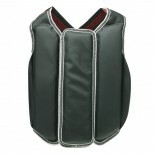 Hassle free wear and removal with front velcro closure. Black on one side, red on the other side. Color: Black & Red ..
WKF approved chest guard Crafted with the user in mind, the chestguard is thin and worn under the uniform. Mandatory in all tournaments sanctioned by the WKF. Must be worn by every competitor in all kumite categories. Consists of three layers: On the exterior is Cordura, an advanced performance fabric that is resistant to tears and abrasions. For the interior, Flexiroll (high shock absorbing foam) is used to..
Thai Smai Belly Guard Rigid design offers durability and significant reduction in impacts from knee strikes and kicks. 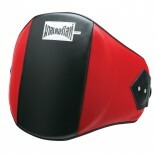 Allows students to land clean strikes to the midsection if used in conjunction with a kick pad. Without a belly guard, it is much harder to land a clean strike on a pad holder. Essential item for pad holders. Buckle enclosure. .. 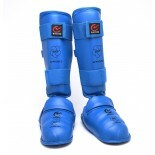 Convenient lower body protection with maximum freedom of movement. Hassle free clip fastener for easy wear and removal. SIZE: CH, S, M, L, XL, XXL ..